Conjurer Freebie for Y-Stylez Katey! Mein erstes offizielles Haarteil: das LotusHair für Victoria 4 und Aiko 4. Es kommt mit insgesamt neun Farbtönen, einigen Props zum modularen auf- und umbauen der Frisur wie Haarnadeln, aufgesteckte Locken, ein Haarkamm und Blüten. Details gibt es hier oder im zugehörigen Supportforum. 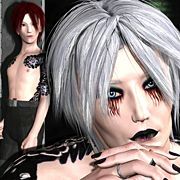 My first official Poser wig: the LotusHair for Victoria 4 and Aiko 4. It comes in nine different colors, several props to build your own hair style plus props like hairpins, lacquered curls, a comb and curl blossoms. Details can be viewed here or in the corresponding support thread. Y-Stylez Akira available at RDNA! und ein schickes Halsband samt Anhänger! Bei Fragen, Problemen, etc mit dem Produkt oder seinen Addons wendet euch vertrauensvoll an diesen Thread im Supportforum! plus a stylish choker and pendant! Should you have questions, problems with this product or its addons, visit this thread in the support forum!